The trail has been magical and painful. Most of the time I just feel in awe that I am actually here and doing this! It’s hard to remember everything and find time to write, but I’ll do my best to give you the highlights. I think I will look into one of those dictation apps- I have so many things I want to remember to share when I am walking, but after setting up camp and getting warm for the night I often find that my mind has blanked. If you know of a good app please let me know. A whole lot of climbing put my feet in really rough shape. I also took a little 2 mile detour to get water… I called those my “bonus miles” and I think those miles put my feet right over the edge! 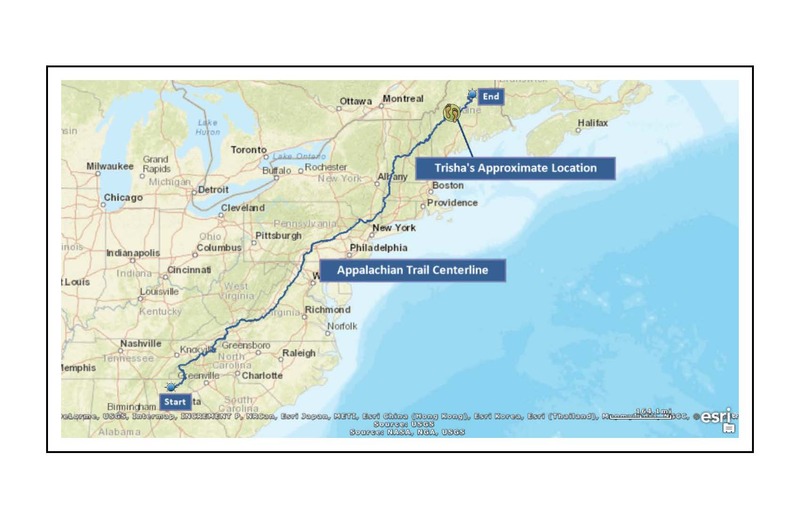 I successfully assigned my first trail names to a couple of young guys hiking together. One of them, Chris, had a Matthew McConaughey voice and I could always hear his distinguished laughing a mile away. The first time we heard the two of them coming, we thought that they were an entire Boy Scout troop that we had been leapfrogging! The other hiker, Tom, was camped at a site in the opposite side of the road from us, and we could hear him making up long, drawn out stories that ended with “No, just kidding that didn’t happen”. They seemed to be having a blast, and I named them “Chuckles”(Chris) and “Tall Tale” (Tom). I liked the alliteration with their real names, and they liked them too so they stuck! Woohoo! 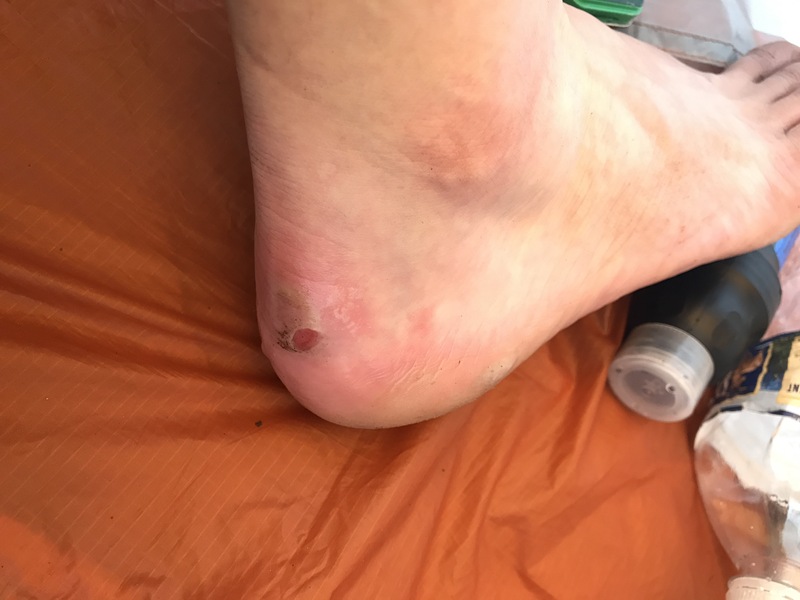 At camp in the evening, I was getting water when a man commented “Wow, your heels look really bad!” I hadn’t actually looked yet- so I took a peek- both heels had wide open sores and I had many other blisters also. The good news was that the rest of my body felt only slightly sore, as in I could tell I worked hard but felt fine otherwise. The blister that started it all and tried to end it all! 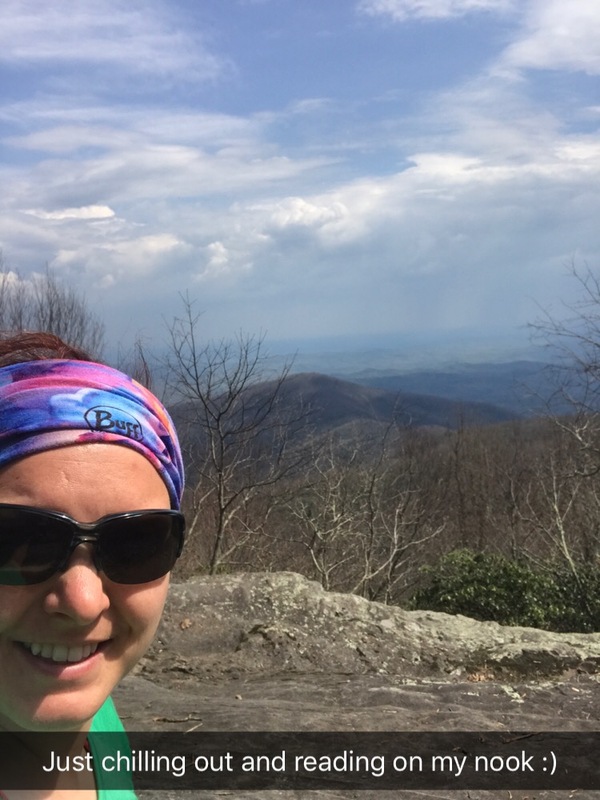 A lot of people were violently ill after Blood Mountain (Day 4). There was vomit along the trail and near our camp a girl was up all night sick. There were at least 5 other people at that camp that said they had gone through it also- seemed to be about 8 hours of violent GI distress and then they recovered. We somehow managed to dodge it and are both still healthy. I gave up on my sleeping mat- I was waking tangled in it and it was doing more harm than good, so I just started sleeping on the ground. 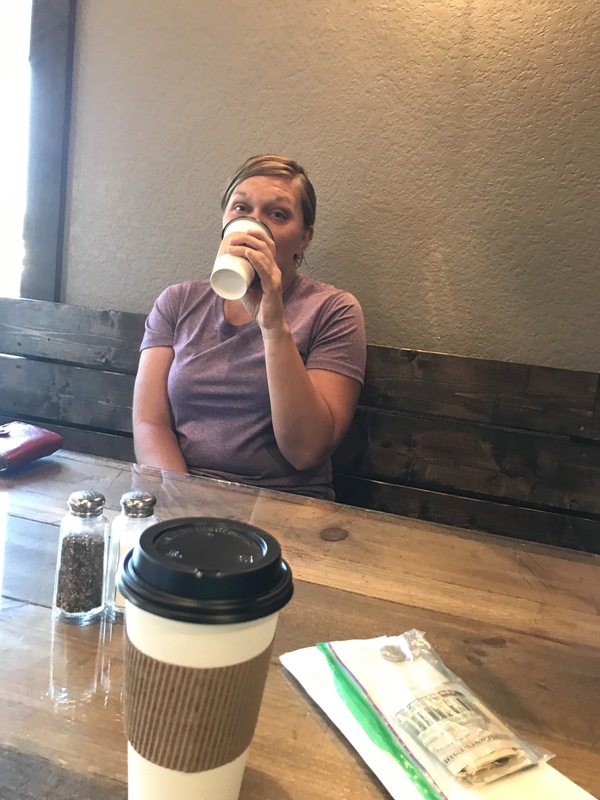 I went to bed feeling really disappointed about my feet, but also knowing that we were only 10 miles from town so I could get situated the next day. My feet were completely mutilated, so I decided to hike the 10 miles to our first town in my crocs to give them some wiggle room. The first 5 were a breeze, then we hit rocks and I rolled my ankles a dozen times each, but my feet still felt ok. Chuckles and Tall Tale caught up to us at the very end, and Tall Tale started singing the Crocodile Rock song- and I had a feeling he was going to try and name me after those darn crocs, but he got distracted and I escaped that misfortunate name. 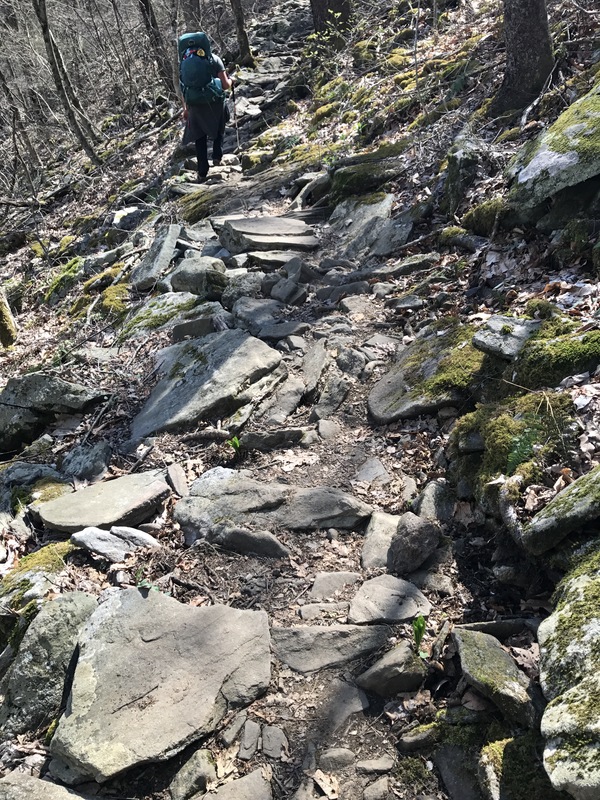 Rocky trail down to Hiawassee in crocs! 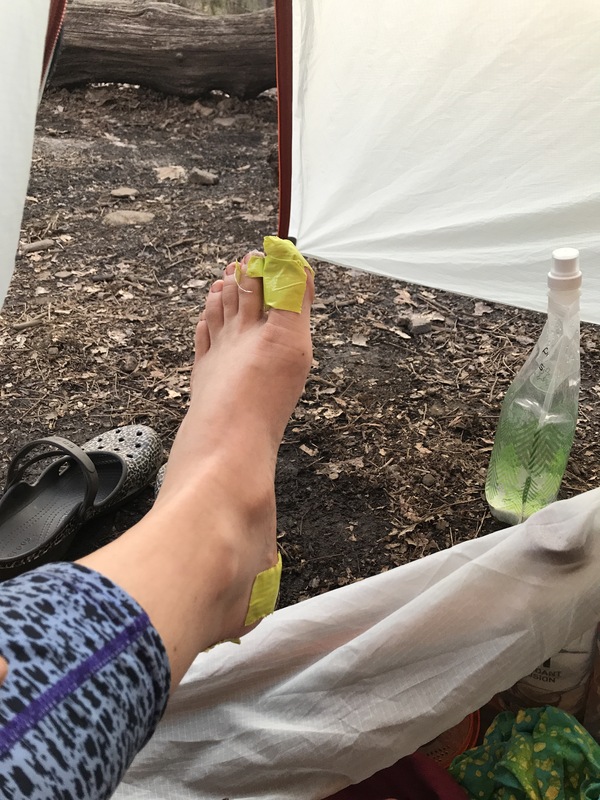 I did end up with one new blister and debated on taking my first “Zero” (a Zero is day with no hiking, generally in town but can also be at camp). My heart and my head were not ready to zero, but my feet were screaming that they wanted a day off. I decided to get them cleaned up and maybe soak them and then decide on what to do. We checked into our dirt motel and I quickly decided that there was no way I was taking an off day in there! 5 minutes in I was ready to be back in my tent. Shelley got first shower while I scoped out the laundry scene and got quarters. I hit the shower next and was surprised to find out my feet got a free soaking during the shower- the drain was so clogged that the water in the tub filled up to my calves during my very short cold water shower. Wasn’t quite the foot soak I had in mind, and kind of grossed me out. The water switched from boiling hot to freezing cold and I didn’t care one bit- it all felt wonderful. After the shower, I sat in my sports bra and homemade rain dress (my Aunt made it for me out of a garbage bag) and waited for our laundry to finish since I do not have any extra clothes. I tended to my foot wounds and intended to relax them after dinner. As soon as our laundry finished we started our journey through town for dinner. We stopped at a growler shop where you could purchase beer samples but no food or pints, due to the local laws. We tried a few tasty samples and then carried on to the pizza buffet. 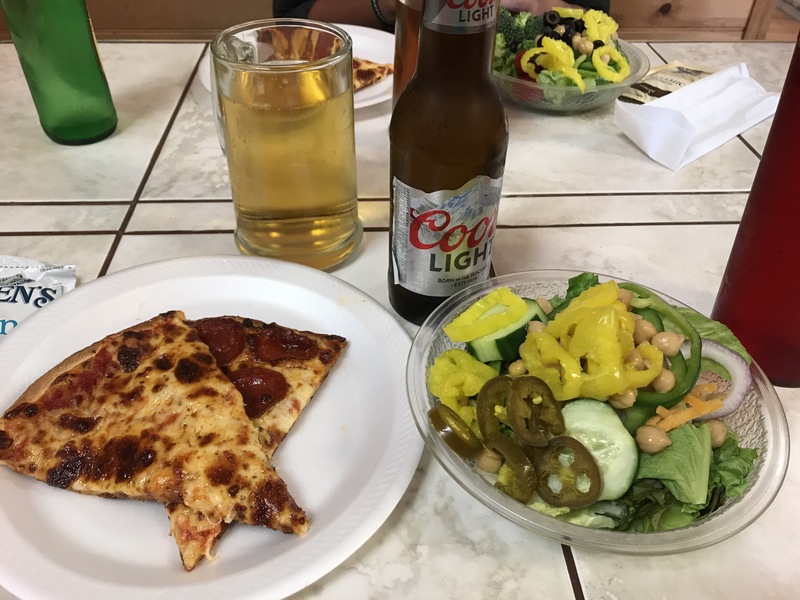 It was a little further out then we thought but was delicious and very filling, the best part for me was the fresh veggies, chickpeas, and jalapeños. We stopped by a few little stores but were not able to find shoes for me, in fact we weren’t able to find shoes at all. When we got back our bathroom light had died so we used our headlamps to wash our camp stoves, faces, and use the toilet- at least we are resourceful! My resupply box was not yet at the hotel, and I was a little worried since this was my first one. My resupply boxes contain all of my homemade food to get me through to the next stop, and this one also had the shorts that I forgot- I was in dire need of them because I was experiencing bad chafing. We woke up about 7am and headed to an adorable cafe for breakfast. 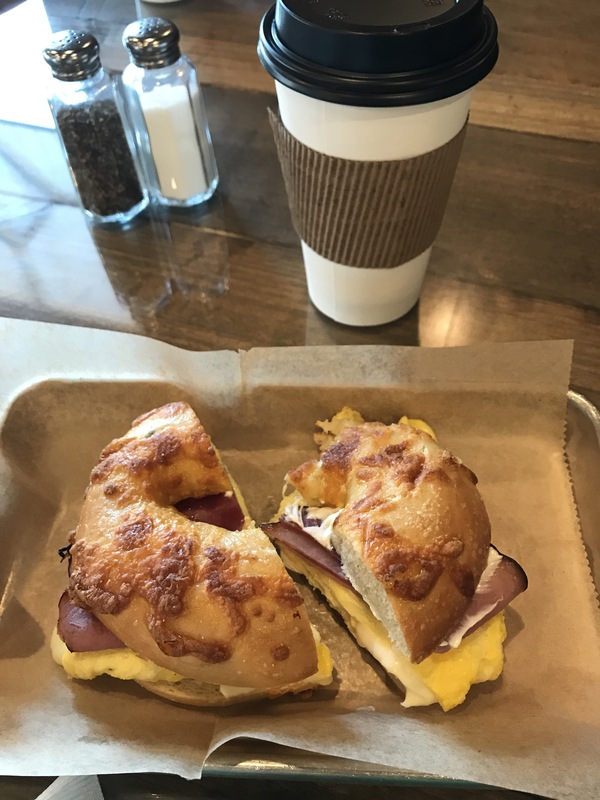 I enjoyed a wonderful and humongous breakfast sandwich bagel and the most delicious Carmel macchiato I have ever had. 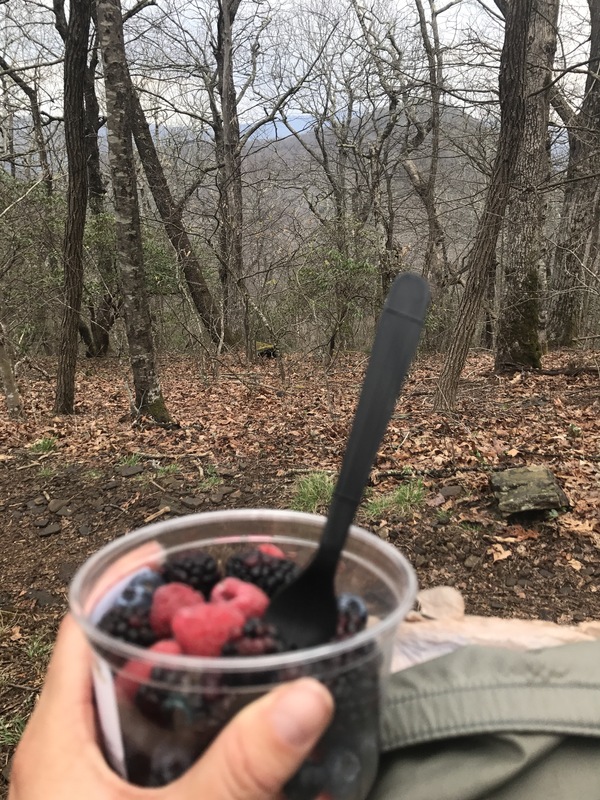 We picked up some groceries- I was craving fruit and got a bowl of berries and an apple tray to take back on the trail. We both planned to shower again in the AM before checking out but I changed my mind when I realized it would be dark AND flooded, and I already had my feet all taped up and didn’t want to redo it, so I just did a little wipe down. Shelley was determined to get her money’s worth out of the shower so she rigged her headlamp and went for it- and miraculously during her shower the light turned back on! Unfortunately it was time to go and too late for me. My resupply box had not come in time for the shuttle, so I had to head out without it. I had plenty of food but really needed those shorts and a few other comfort items. Shelley steamed straight up the mountain and I caught her at the top when it flattened out. It was a lot of climbing again, but my feet were taped up well and I had that amazing sandwich fueling me so I felt great. We got rained on for the first time, I actually loved it because it was so hot it felt nice to cool off. I had a break on a little rock and enjoyed my delicious berries. 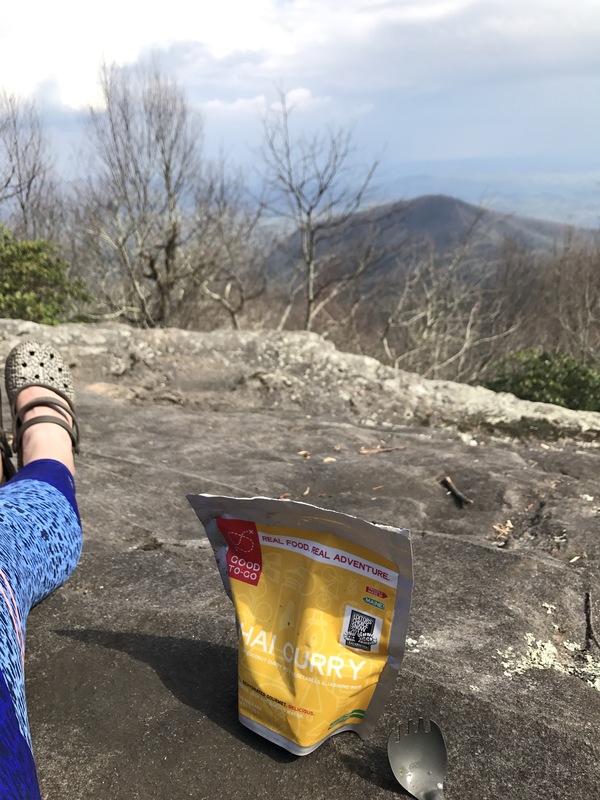 Enjoying a berry break with a view! Shelley had skipped breakfast and wasn’t feeling well, so we stopped about 2:30 pm and called it a day. I felt great and was really happy I didn’t end up taking that Zero. I did pass a lady that wanted to name me “Rainbow Brite” because of my colorful apparel. She might be in to something- a bumblebee and a butterfly landed on me! Since we arrived at camp so early, I did a little tinkering with my gear. I cut up my bandanas to turn them into various cleaning cloths (one for stove, one for face, etc.) but my most impressive MacGuvery-ing of the evening was creating a funnel out of a plastic hotel cup, namely because by knife is about 1/2 the size of my pinkie finger. The funnel is for my UCAN drink powder- I was making a mess every morning trying to pour it into a water bottle, so I was excited to resolve that! It’s the little things 🙂 I also found a wonderful view and watched hawks and crows while enjoying my dinner. Things got really exciting in Day 8! Can’t wait to tell you about it- but it’s Hiker Midnight and time for me to hit the hay. So happy your loving this experience! Great stuff! I LOVE your views!! O. M. Ggggg. you crack me up & Amaaaaaaaze me, girl. o, do you need anything???? let me know and I shall send or place on my blog. This is so great reading about your days. You are brightening mine with your joy Trish! You keep amazing me! Prayed your feet will heal quickly. Love and much happiness sent to you!! Thanks Debbie, I really appreciate it! 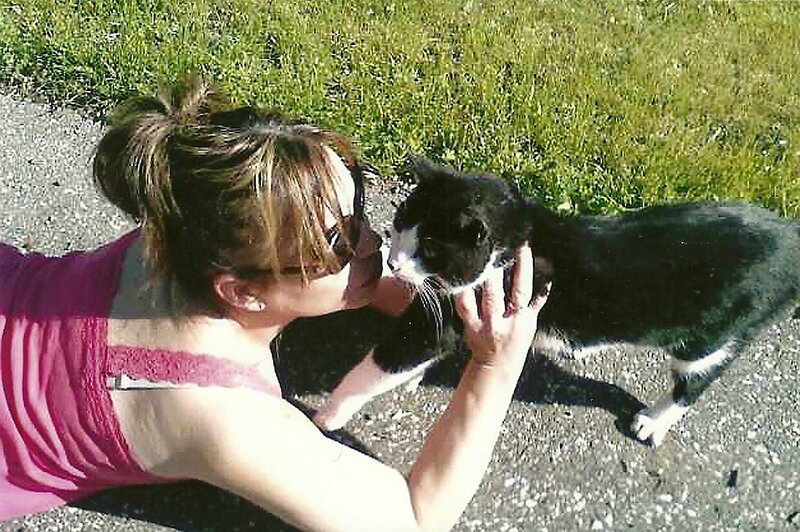 You are a hero in my book…..I am so very proud of you! You are definitely an inspiration!! Enjoy every moment of it!! What a great read. Keep going! I’m glad everything is generally going well, and you seem to be having a great adventure, and experience!! The stories are awesome as well!! Inspiring to be sure, I love reading about your hike! Wow, just wow . . .